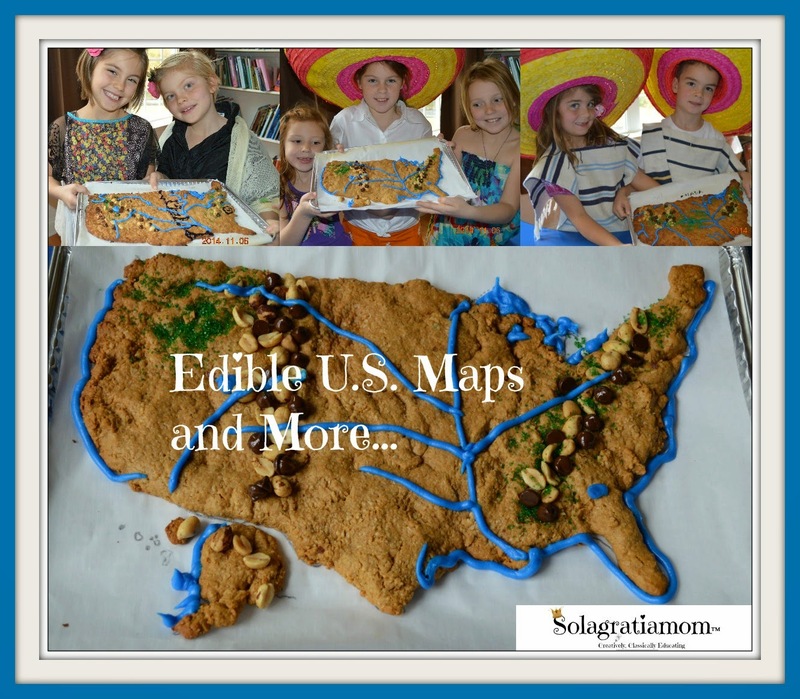 Solagratiamom: Edible U.S Maps and More! Edible U.S Maps and More! Today in Wonderful Wednesday, we stepped away from the science blitz format we've been doing. We had already covered lungs in our previous week when we looked at the Excretory System and made a working lung model. So, it seemed fitting to take a little break and focus on our geography and music theory, with a little abstract art for fun thrown in! Thanks to a Facebook question post, wondering if Mrs. Leonard had something gross planned again for this week (apparently, they were hoping so), I mentioned that I made 9 batches of peanut butter dough in anticipation of our map making morning and that I needed a massage (who knew peanut butter dough was so thick and difficult to mix!). So...to start out, that's exactly what the kids all lined up to do! At the prompting of one of the Moms, I was whisked away to sit in a chair and the kids lined up to give me a massage! LOL! There is truly never a dull moment with this crowd! We then headed off to serious business as I announced to the kids that I hoped they studied for their test this morning. They all looked at their Moms like "Is this lady serious - I thought we only have fun here?"! I then told them that they indeed had a test this morning and proceeded to get out a pad of blank U.S. Map pad (30 count) (my US map pad is 3+ years old but the one I've linked is the closest to what I have that I found) for them to fill in with all the states and capitals! The kids went ahead and filled out whatever they knew and then I had a book with facts about the US and each of the kids picked a state to have me read about and we went around the table, as I read various facts about the states chosen. I then showed the kids how to begin drawing the US map by blobbing. We broke the map into four sections and I explained that we could use our imaginations to "see" things in each section, to help us draw it. If you want more detail about how to teach the US blob map, then you can go over to my post on "How to Start Young Kids on Drawing the US Map". 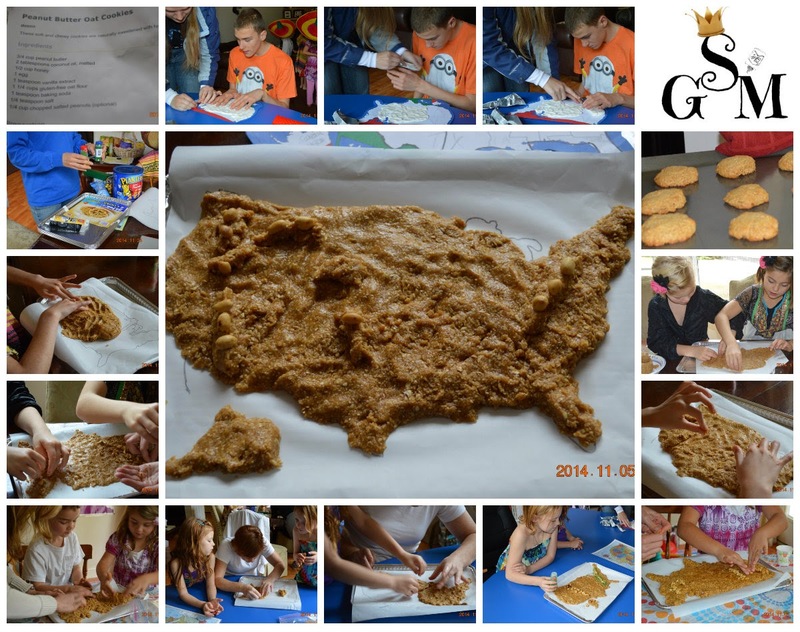 The next activity I announced was the peanut butter cookie dough map we were going to be making! The kids were given a placement that had the US on it, a piece of parchment paper, tin baking sheet and sharpie marker. 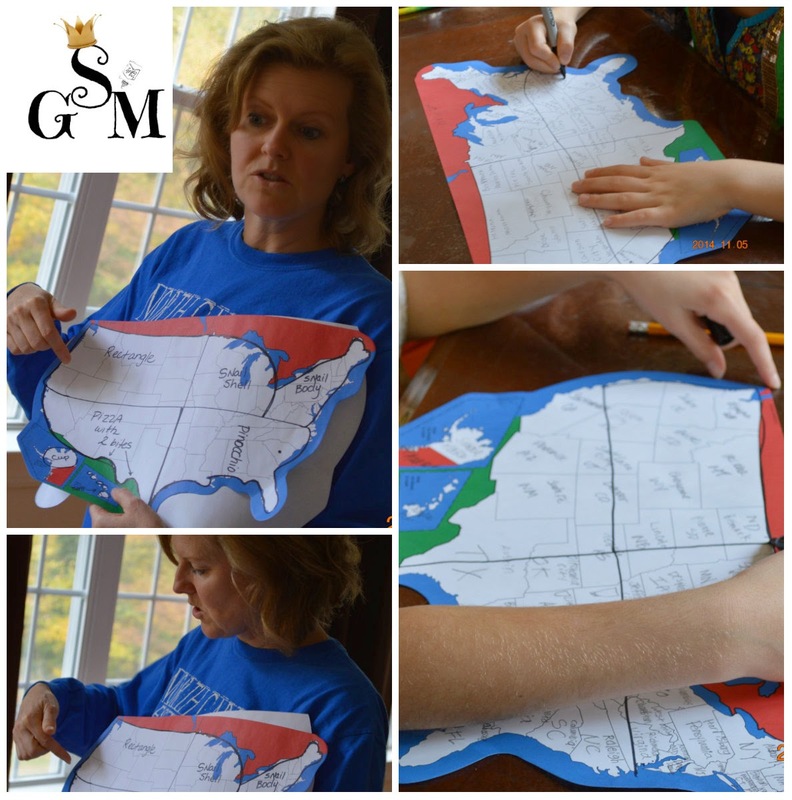 They placed the parchment paper onto the placemat and then traced the outline of the US, so they would have something to follow while forming their dough map. We had a guest appearance this week by Mason (my special needs son). 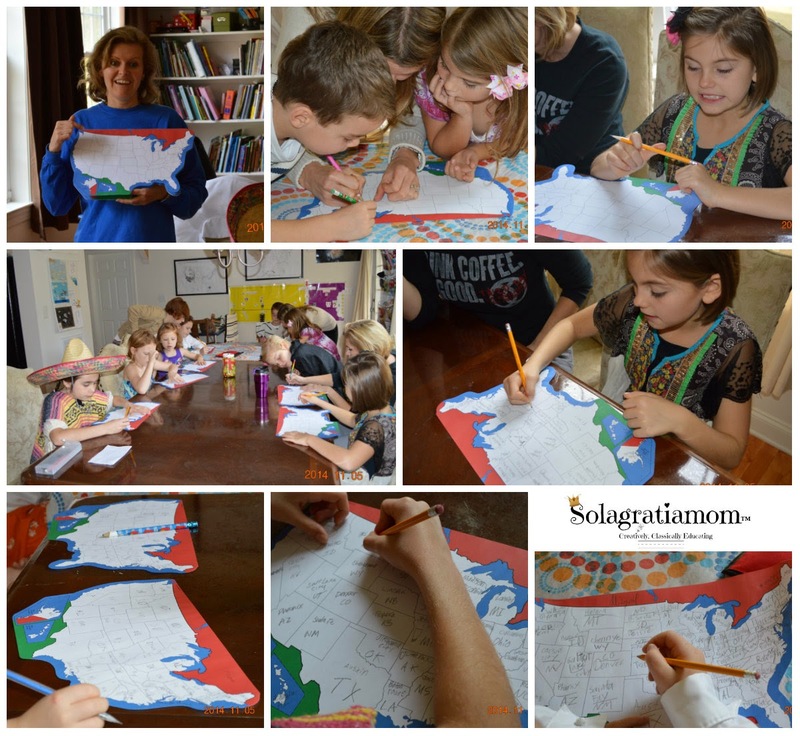 He LOVES the US and geography, so he was interested in making a map with us. Due to his allergies, we had him make one out of model magic instead. He loved it and wants to make another one very soon, he said. I had pre-made the dough to save time. The recipe is easy and healthy. I then gave the kids items they could use to decorate their US map, so they could notate physical features. 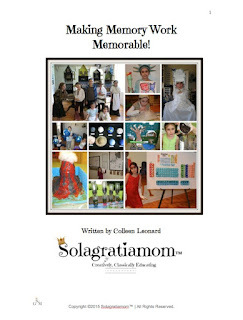 We used: peanuts and chocolate chips for mountains, blue decorating frosting for the waters, green sugar crystals for the forests and black edible gel pen for anyone who wanted to notate states (or one of the Moms made The Little Man In the Map: With Clues To Remember All 50 States ). I'm a healthy eater and I dislike giving kids "junk" like blue dye based frosting and green dyed sugar crystals. I did make the peanut butter cookie dough out of organic peanut butter, oats and honey instead of sugar, so that kind of off-set it for me. However, my daughter is allergic to the blue and green dyes so her map had to stay "water and forest free". So we used peanuts and diary free chocolate chips for her mountain features on her map and called it good. We did take the extra dough we had left over and made a couple batches of cookies for the kids to eat later with their snack! While our maps cooked in the oven, we moved on to the next project. I took my white board and had the kids give me all the music symbols they have learned so far this year, during music theory. I drew each one on the board. 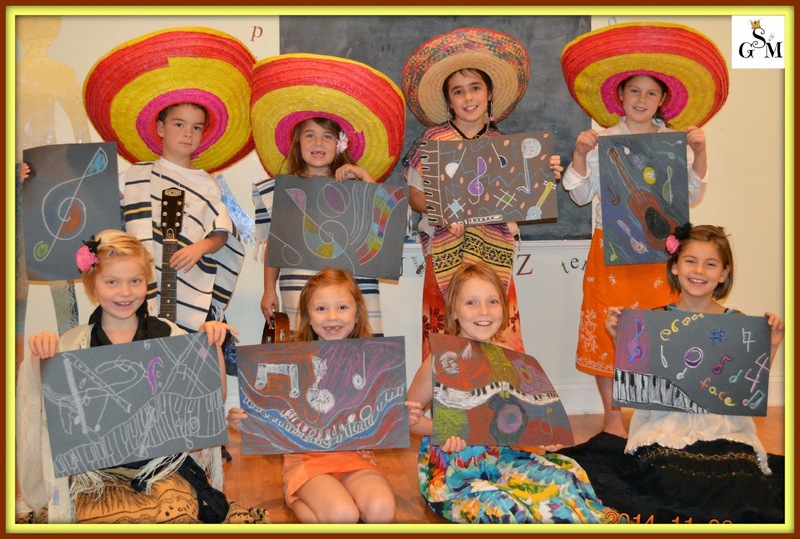 We discussed each of them and then the kids were given 12"x18" black Construction Paper and Oil Pastels . 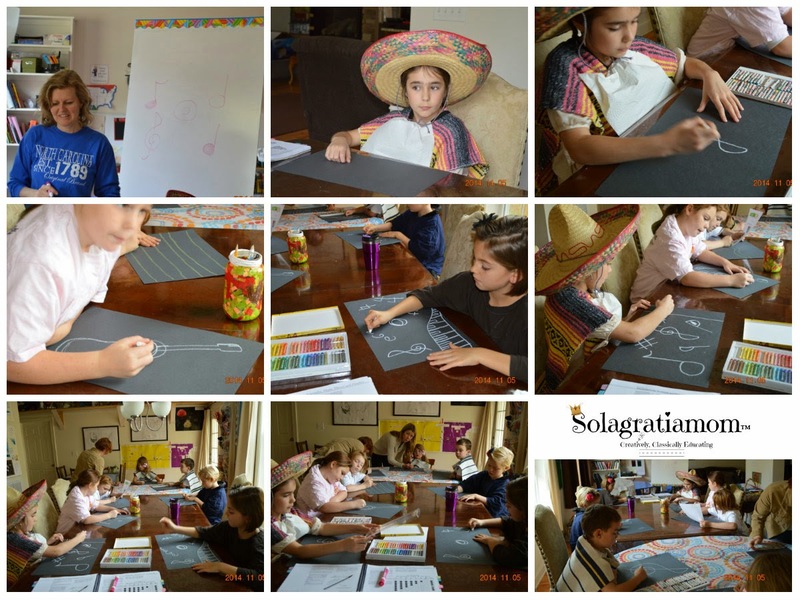 They were told to draw with a light or white colored oil pastel on their paper, any and all music symbols they would like and make their own design. Then they would color them in with their various pastels available. They could make them go off the page and fill up the entire sheet but that is a hard concept for kids. 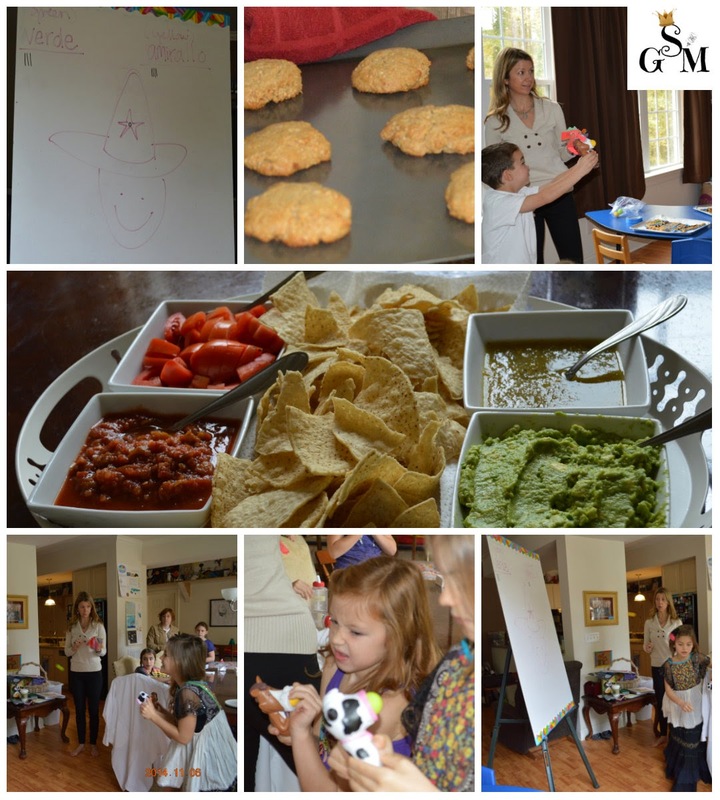 To end our day we had a Mexican themed snack (made in the colors of the Mexican flag - clever mommy we had) and the kids played a fun game. After answering their review questions correctly, they had to shoot a ball out of the animals mouth onto the white board and the one closest to the star got the point. They ended with some delicious (and quite healthy!) peanut butter cookies! All in all, it was a Wonderful Wednesday! I hope yours was too! I adore all of the creativity in this post! I want to know where you got those US maps for the kids to fill in -- I like them! What fun! I love it all. You are so creative! I appreciate your comment and stopping by Phyllis! Thanks so much. We're doing the states now and this is definitely going on the list of activities to do. Thanks for sharing it! What a great day! An educational experience disguised as a party! I love the cookie dough map idea! Thanks for sharing at FF! I love all of it! How creative...especially the edible map!! What wonderful activities. I love the map pad. I put it on my wish list. A peanut butter map is so much better than a salt map =) Fun!